Here’s an ingredient that hasn’t shown up in any avant-garde new restaurants yet: smog. A new project coming to New York City will feature an entire smog tasting menu. If you think that sounds like it will taste terrible, you might be missing the point of the exercise. IDEAS CITY, a New York festival that explores the future of cities around the world, created meringues made with air pollution from London, Atlanta, California’s Central Valley and Los Angeles circa 1950—back when it had some of the dirtiest air in the world. The cookies are part of an awareness program designed to take otherwise tedious air-quality data and transform it into a more visceral experience. Even when living in a city with pollution problems like LA, you might not notice the air issues for months or even years. But put some of that particulate matter on your tongue, and you’ll notice right away. 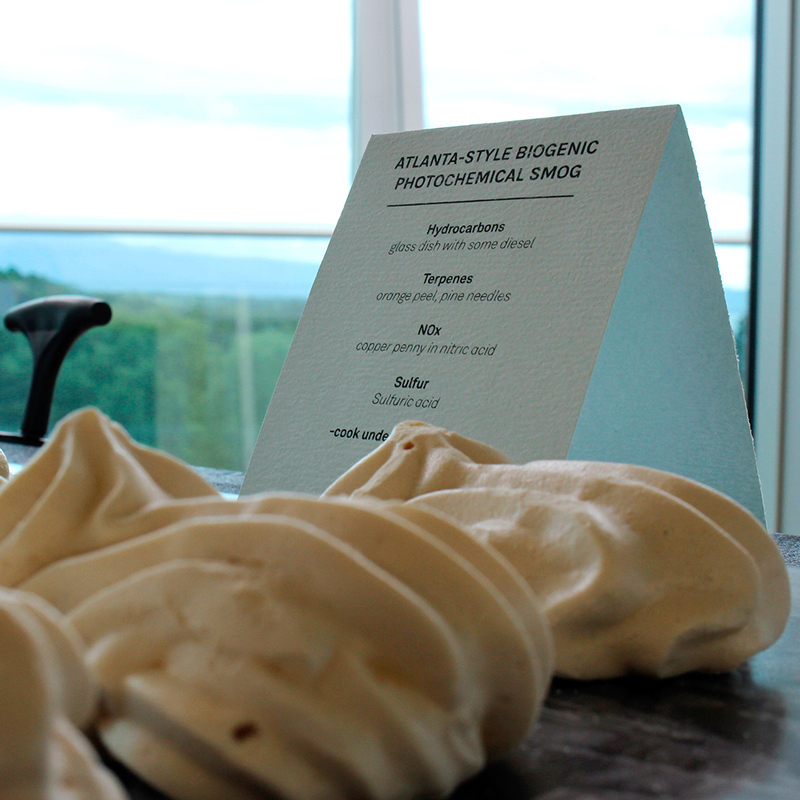 Nicola Twilley, co-creator of the smog tasting, told us each meringue actually has a unique flavor. “The LA one has an ozone-y, almost bleach-type note, whereas the London one is a little sulfurous—like the smell of a struck match.” It’s like tasting the terroir in wine, but much dirtier. Twilley also made sure to emphasize that while you might not like the smoggy flavor profiles, they should not be particularly dangerous to your health—an obvious concern for anything that tastes bleach-y. Well, at least the smog meringues will be sweet. And for those interested in the project, don’t worry, there will be plenty of actual food and drinks to wash the smog out of your mouth. The food court will feature sandwiches from Williamsburg’s The Meat Hook, doughnuts from Doughnut Plant and pizza from cult favorite Roberta’s. IDEA CITY takes place from May 28 to 30. The smog-tasting is part of the street program on May 30, which takes place outside on Bowery in Manhattan between Rivington and Houston streets.